With thousands of refugees and migrants pouring into Denmark, a weary Danish Defence calling for a timeout and a bombing campaign that has yielded inconclusive results, Denmark’s role in the Middle East is on the cusp of change. According to Mikkel Vedby Rasmussen, a professor at the Institute of Political Science at the University of Copenhagen who is an expert on Danish foreign policy, Denmark and the coalition stand at a crossroads in the Middle East. In co-operation with Helle Malmvig, a senior researcher specialising on the Middle East at the Danish Institute of International Studies (DIIS), Rasmussen is behind a new report that investigates Denmark’s options in Iraq and Syria. The report, ‘How will it end? Refugees, civil war and Denmark’s dilemmas in Iraq and Syria’ (here in Danish), considers the possibilities Denmark has to help stabilise the region. Broadly speaking, there are two roads available, it contends. Denmark can either choose to increase its coalition engagement and commit to a more long-term civil and military effort, or it can scale back its military efforts and focus primarily on providing humanitarian assistance in the region. 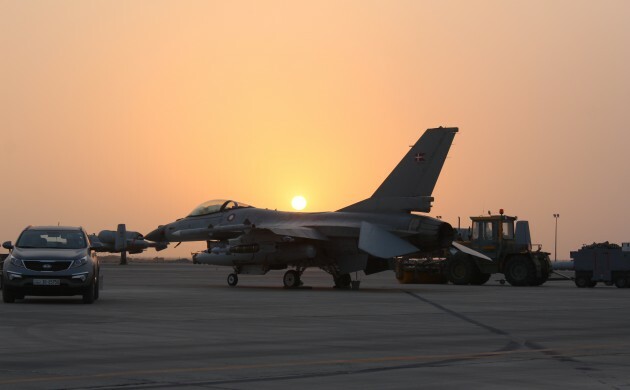 At the moment, the only decision that has been made is to pull back the F-16s for a period of time after Peter Bartram, the head of Danish Defence, contended that the squadron needed a break. But a larger, more expansive decision on Denmark’s role in the region could come sooner rather than later. “I expect that Parliament and the Foreign Affairs Committee will discuss that over the next month or two, perhaps depending on what the coalition is doing. Britain, Australia and France are enlarging their military scope in the region, so that is also something to take into consideration,” Rasmussen told the Copenhagen Post. Rasmussen went on to maintain that it was doubtful how much of an impact the bombing campaign has been in stopping IS, and he went as far as stating that the Iranian infantry had been far more effective than the western bombs. “When you consider that we’ve been part of various types of military and civil engagements in the Middle East over the past 25 years, it’s only reasonable to expect that we will remain engaged in the region for the next 25 years. Now is the time to take stock and ask what worked and what didn’t and what we can do in the future,” he said. Danish boots on the ground is currently not an option: not because the Danes don’t have the capacity, but because it isn’t the coalition’s strategy at the moment. But that could change. Denmark has traditionally been very active in US-led coalitions and was among the nations to deploy the most troops per capita in Iraq and Afghanistan. But that doesn’t need to be the case now, and being a small country allows for the freedom to pick and choose its role, unlike the US, argued Rasmussen. “The Danes are pulling back from the bombing campaign temporarily or permanently in the near future. And while we might deploy a radar in the near future to support the bombing, someone else might be doing the bombing,” he said. Other means of support could include logistical support, inserting a special forces unit or offering training to the Kurds, the report conveyed. But there is the other alternative: focusing on the humanitarian catastrophe that has personified the Syrian civil war and working to ensure that it doesn’t destabilise the neighbouring countries – such as Turkey, Lebanon and Jordan – which are all struggling under the weight of millions of displaced people fleeing the conflict across borders. “Lebanon is a good example of that: a country with some 4 million people and more than 1 million refugees, which is obviously a situation that few societies can sustain. The UN and the aid organisations have said they lack the funds to properly help the situation. The list goes on and on. There are plenty of areas in which Denmark can do its bit and do something special,” said Rasmussen. Last week, Denmark earmarked another 70 million kroner of aid for Syria, and with its latest donation, the Danes have donated almost 1.1 billion kroner in humanitarian aid since the crisis started back in 2011. Rasmussen was quick to underline that after a quarter of a century of activities in the Middle East, it’s time to take a hard look at the Danish strategy in the region and decide how Danish foreign policy should be formed in the future. “When you consider we’ve been part of various types of military and civil engagements in the Middle East over the past 25 years, it’s only reasonable to expect we will remain engaged in the region for the next 25 years. Now is time to take stock and ask what worked and what didn’t and what we can do in the future,” he said. But there is no doubt that Denmark and Europe must react, and that has become clear to many in the wake of the current refugee crisis. It’s not a choice, it’s something that must be done, argues Rasmussen.